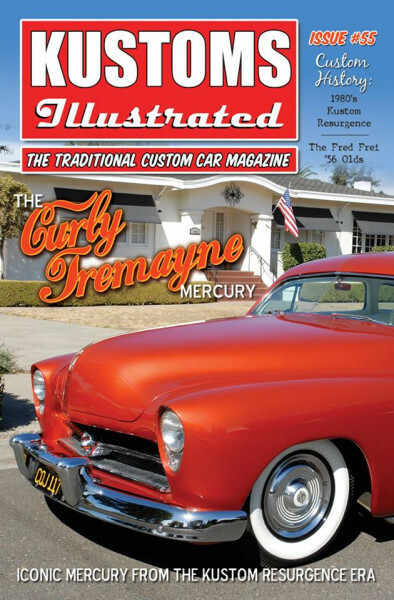 Produktinformationen "Kustoms Illustrated Issue #55"
We have a super issue for you this time around with the focus being on the 1970s & 80s era Kustom Resurgence! Our cover car and centerfold is a direct result of that resurgence and has been meticulously restored to perfection. The Curly Tremayne Merc is one of the most iconic custom cars to emerge from the mid ‘70s rebirth and we bring it to you in all its Tangerine glory! To continue our theme, we bring you a ten page light-hearted article titled “Where were you in ’82?” that touches on the second coming of age of kustoms when clubs like Kustom Kemps of America and West Coast Kustoms helped usher in a new era. (This is only Part One of the story, so keep an eye out for future issues.) Lots of never before seen photos! Kustom Kulture artist and all around good guy, Dennis McPhail gives us his take on growing up in the 70s and 80s and what it was like to attend the first KKOA Leadsled Spectacular in Wichita, Kansas. Plus, we get a peak at his new series of posters that are a must-have for any kustom fan. Check out “Kustoms with a “K” in the new issue. Event coverage includes the midwest’s newest all-kustom custom car show called “Lead ain’t Dead.” Show producer and promoter, Mickey Bryan, gathered some of the coolest sleds together in his home town of Dewey, Oklahoma, and boy did they have a blast! See it here first, in Kustoms Illustrated! History is a big part of our DNA here at Kustoms Illustrated, so we are proud to bring you another in-depth article by noted Custom Car Historian, Ray Soff. This issue, Ray tells the story of the Black Widow ’56 Oldsmobile built by A & A Auto Body and owned by George Groesbeck and Fred Frei. As always, we have never before seen photos of the car including photo shoot outtakes from 1960! Weiterführende Links zu "Kustoms Illustrated Issue #55"
Kundenbewertungen für "Kustoms Illustrated Issue #55"